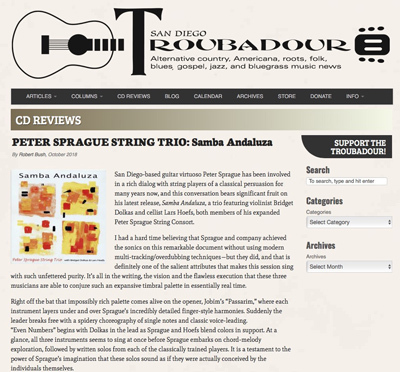 Hi Good People, it’s great to be connected once again and I know it’s been awhile since the SpragueLand gig email found it’s way into your inbox. I’ve been out of the communicado industry for the last month or so and I’ve got a few stories to help fill in the lag. 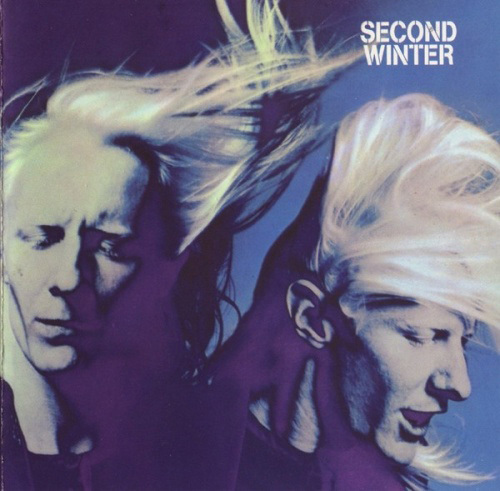 First off, to set the stage, Johnny Winter’s Second Winter is blasting out some virtuosity blues guitar shred and it’s a fitting soundtrack for my opening tale. 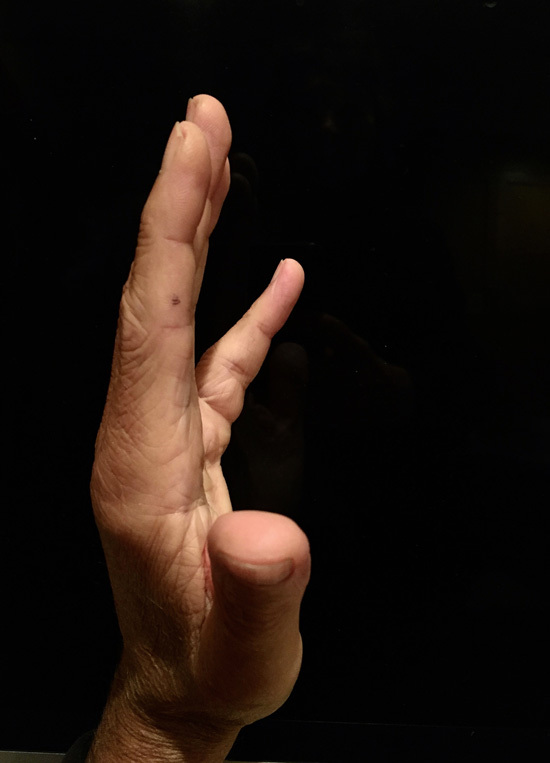 Shred guitar – one needs their fingers in tip top shape to pull this off. The little dude won’t straighten out! It’s purple because the solution is also designed to dissolve some of the funky fibrous material. These are a bunch of the solos I worked on growing up. With the full on upgrade of slowing down the music and hearing it clearly technology, the book is more accurate and better than ever before. It’s also now a lot more legible because it’s written out with the computer and I also added around 5 new transcribed solos to the book. What a great time revisiting some of those classic frozen moments of music! 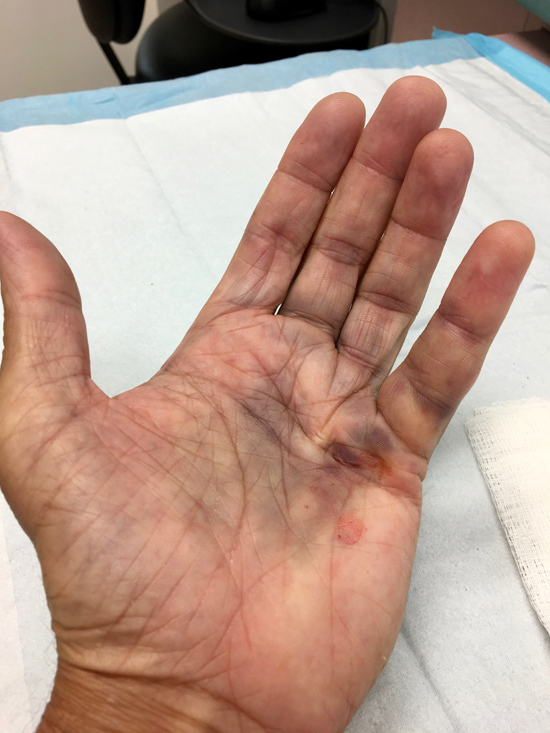 The book project took about a week to complete and for the second week of “hand rehab” I set out to work on arranging for an upcoming Christmas concert with the Camarada group. We’re playing on December 2nd at the Automotive Museum in Balboa Park and have a really cool ensemble to express the music through. 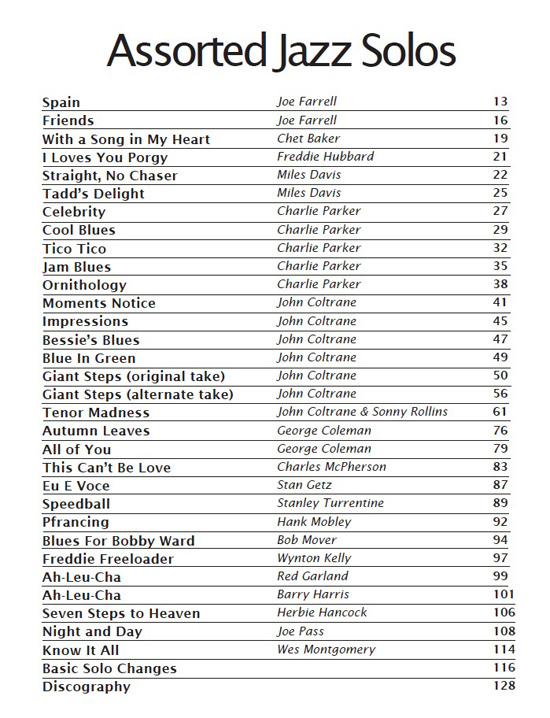 I took some classic holiday songs, added my jazz spin, and also added a few lesser known ditties into the mix. I can’t wait to hear it with the band! Look to the bottom of the page for the concert info. Camarada with (left to right) Beth, PS, Gunnar, Duncan, and Bridget. 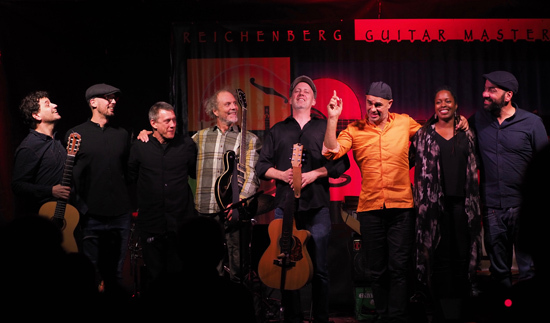 During this whole PS disappearing act I took in two inspired Pat Metheny encounters. First off was his incredible concert at the Jazz at the Jacobs event at Symphony Hall. The band was insane and the jazz shred was ON! He covered a whole slew of his “bulletproof compositions” (his words) —songs designed to be semi-rearranged on the fly and thus, “new” every night. We had a great hang afterwards with cool stories and tall tales of the semi-questionable music business. 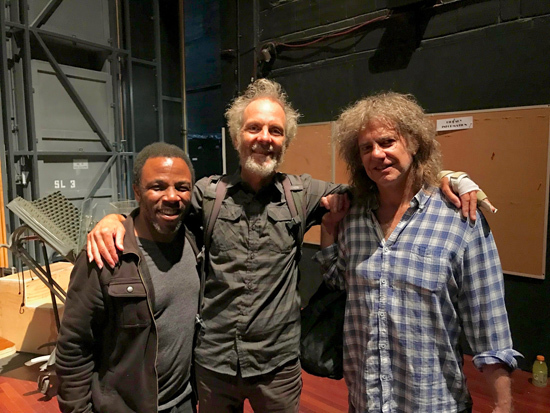 Leonard, PS, and Pat Metheny. 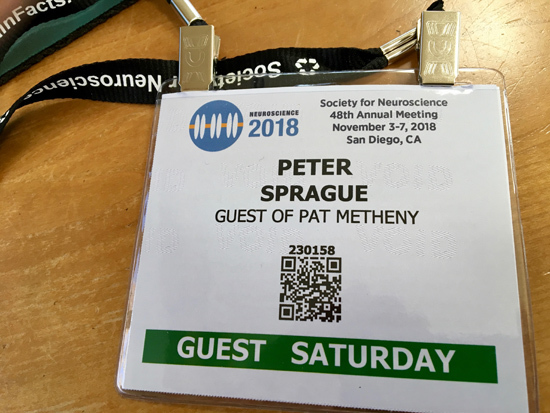 Pat said, “man, I’m going to be back in SD next week doing a keynote speaking gig at the Society of Neuroscience’s Annual Meeting. You wanna come?” For sure yes and Pat got badges for George Varga and I to witness him keynoting in front of five thousand ultra smart people. Off the Richter! He spoke, no guitar, and was as eloquent as they come. Gifted fellow on all fronts that one! Beautiful observations and he made a real connection with the scientists in attendance. He answered questions and carried on and one of the big discoveries for him and for all of us is that the ears pick up the analog signal of music and this gets eventually converted to a DIGITAL signal on it’s way to the brain. Crazy that digital could carry so much emotion with it! This morphed into a fancy lunch hang with Pat, his wife Latifa, George and myself. Ultra memorable moment # 2039! All badged up to hear Metheny talk instead of play guitar. So worth it! 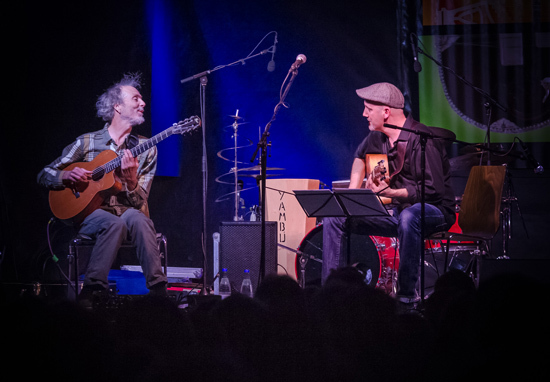 On one of the concerts I played a duo set with Adam Rafferty. He’s a beautiful player and a funny guy too. He got well known by playing a super unique solo guitar version of “Superstition” that has over 2 million views. 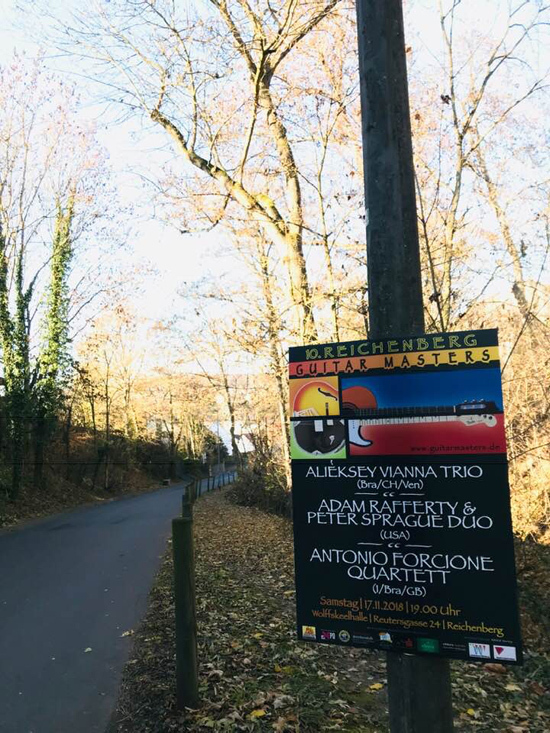 Here’s the poster for the concert on some lone telephone pole out in the country in Germany. I borrowed a Gretsch guitar for one of my sets! For the finale of the concert we all played together. Here’s the final bow. 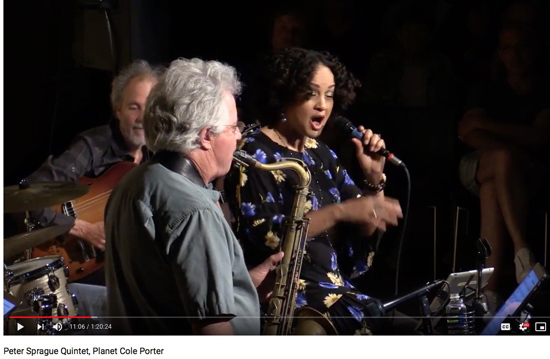 Over on YouTube a live concert that me and the Planet Cole Porter gang played in Palm Desert earlier in the year just surfaced. It was a cool night of music and the recording and video production are well put together too. It’s here. 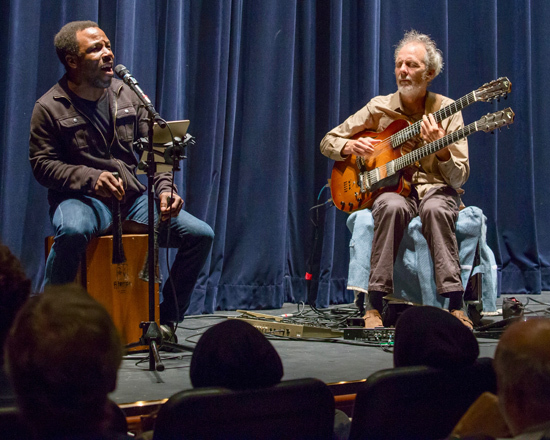 Hey great news on passing along acquired skills and trade secrets to the next generation of jazz musos. This could be for oldsters and youngsters alike. 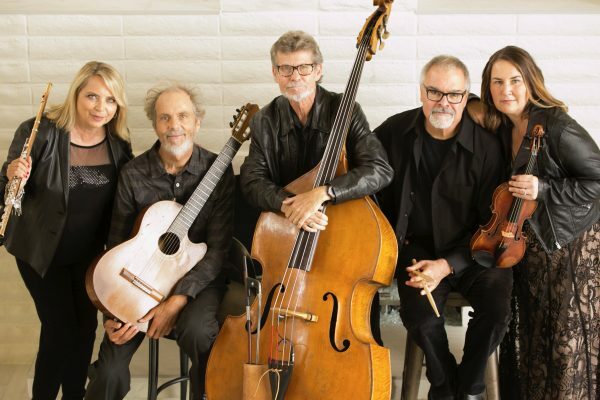 I’m thrilled to be connected with Open Studio — the company that presents both my online jazz guitar instructional video course as well as my Great Guitar Covers course. 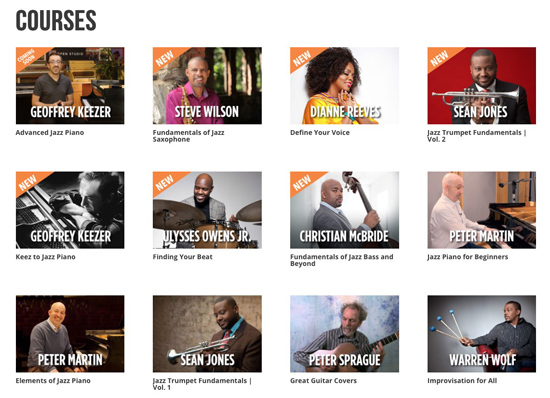 Also on the roster with Open Studio are Christian McBride, Dianne Reeves, Peter Martin, Geoffrey Keezer, Steve Wilson, Warren Wolf, Greg Hutchinson, Romero Lubambo, Sean Jones, and Ulysses Owens, Jr.
Each of these folks have their own courses and all of the Open Studio presentations use incredible technology to make learning a little easier. It’s a great time in the world to raise your skills in music! For this week only (Black Friday sweeps the U.S.!) Open Studio is having a sale with both of my guitar courses at 55% off. This same sale is going on for all of the other courses too! For details go to HERE. Offers are valid until Midnight on Sunday. Folks I think that about brings us up to date. 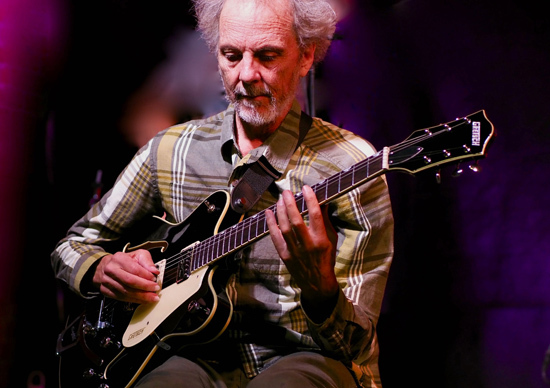 And now looking towards the end of the week, I’m thrilled to be back with my man Leonard Patton to play a show at the always soulful Solterra Winery and Kitchen in my home town of Leucadia. It’s on Sunday night and the vibe is stellar with great food and good sound. Sure hope to see you again, I miss you all! Leonard and PS doing it!